Adam Kalinowski is the mastermind artist behind the large wooden spiral structure, which is home to atleast 3,000 plants. This spiral structure is known as the "Infinite Green Sculpture" and it stands proudly in Wroclaw, Poland. It's constructed with wood and steel and has more than 100 different plant species. It has seven shelves and it's built in 110 square metre. Adam Kalinowski created this beautiful sculpture for the European capital of Culture Wroclaw art program. The Infinite green monitors the environment and uses the dew from the mornings as a source of water for the plants. The beautiful sculptures acts as a natural green house and the 3000 plants blossom at different times of the year. 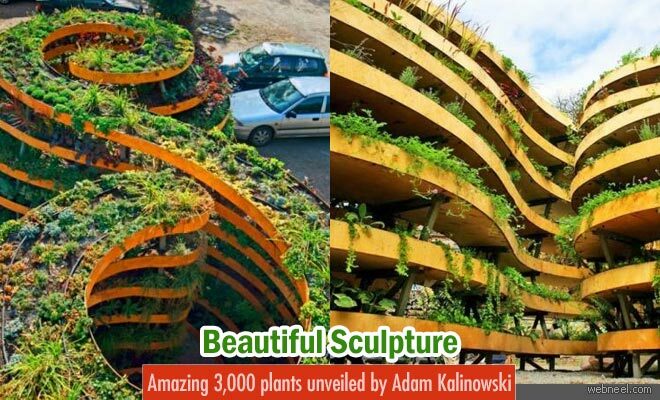 Beautiful sculpture with amazing 3000 plants unveiled by Adam Kalinowski Neel Adam Kalinowski is the mastermind artist behind the large wooden spiral structure, which is home to atleast 3,000 plants. This spiral structure is known as the "Infinite Green Sculpture"